Nothing beats a good story of survival—nothing, that is, except for the privilege of experiencing the story from the safety of someplace that is not the deadly outdoors. Klei, developer of Shank and Mark of the Ninja, seems to feel the same way, and has constructed a survival game that contains many elements of survival, along with a few extra nasty elements, all without having to actually risk your life by picking a fight with a giant pig. More or less, it’s a success. 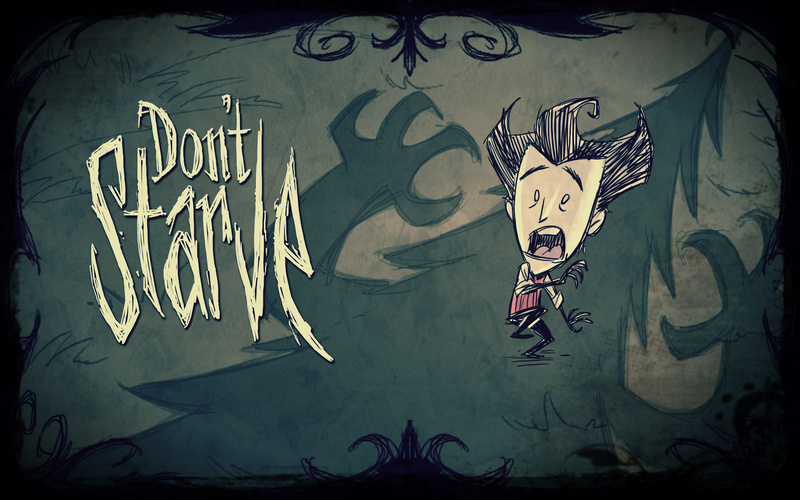 The objective of Don’t Starve is quite simple—it’s right there in the title. It goes a bit deeper than that in its portrayal of a fight for survival. Beyond picking berries and hunting to stave off hunger, there are also evil forces, deadly darkness (repelled only by fire, which must be kindled before the sun goes down), and a variety of extremely nasty creatures. This is a severely unsettling game, made more so by the fact that there is very little story, and literally no tutorials, hand-holding, tooltips, or anything–this is raw trial-and-error. Don’t Starve boasts a magnificent art style—this is seriously some of the best art direction I’ve seen since Journey. It’s as if someone handed Tim Burton a box of colored pencils and told him to start drawing. The creatures are imaginative, and the art itself straddles an incredibly thin line between charming and horrifying. The sound design is great, even if the music is forgettable. The character’s “voice” is portrayed as a quickly wandering violin lick. It’s odd, unnerving, and perfectly suits the game, as do the whistling wind, snapping twigs, and other ambient sounds. Don’t Starve is kind of a roguelike—while there are experience points and leveling, the game world still resets after deaths. It does retain the feeling of roguelikes, however: getting slain in the wilderness not only means that you must start from square one, but the slain adventurer’s items fall around him, as if taunting the player with the loss of wealth. Don’t Starve, like other games of its kin, can be infuriating when the killing blow is struck against the hero, and all of the work gone into survival is whisked away. This is a good and a bad thing. Klei’s gameplay systems mean that a great deal of time can be put into a single run, but this can all vanish in a second. I spent a couple of hours on one run, managing to accrue a multitude of materials and build a Science Machine, just for it all to be whisked away by an overzealous band of Spiders and my own hubris. Then it’s back to square one with nothing but an empty inventory. That, however, is part of the thrill. It’s not entirely aimless and wash/rinse/repeat, however—locating the special door in the environment unlocks the secondary, level-based mode in the game in which the hero must outsmart a mysterious man that seems to be the mastermind of this dark world. This doesn’t make the game any easier, though; on the contrary, the variables that each level add make things steadily more intense until the incredible odds are only rendered barely survivable even with an abundance of acquired skills and materials. It’s a pretty impressive balancing act that Klei almost pulls off, but there are minor imbalances that make the game just a bit too hard for the sake thereof. Like the greatest roguelikes, Don’t Starve features randomly generated worlds. Any time a new game is booted up, an entirely new world is created. These worlds are all very large, and populated with an impressive variety of resources, life, and small curiosities that give the off-kilter environment a singular personality. The random rolls can be slightly altered in a menu where players can adjust day and night lengths, how often certain environment pieces, enemies, and supplies appear in the world, and so on. These things can significantly adjust the punishing difficulty, which is welcome. With any randomly generated game, odds can sometimes stack against the player. I played one game where I never was able to find flint for an axe, and ended up dying during the first night on account of being unable to chop down trees for a campfire. But each death is another lesson, another discovered mechanic, and another reason to push your luck just a little further the next time to see what else crops up. What may seem like a simple survival roguelike quickly gives way to an adventure with considerably more depth. Hunting and gathering is where things start, but they progress to trapping, farming, building a shelter, and finding the components for a Science Machine, which opens up more options for new survival technologies. It would be helpful to have slightly more prominent Health, Hunger, and Sanity meters, as each is a tiny circle in a corner of the screen. Sometimes, death comes much more quickly than expected on account of the too-small meter and a lack of any real notification of impending death. The other two are slightly less problematic as they rise and fall at much slower rates, but actual meters or bars as opposed to filled circles would have been considerably better. The indicators for rising or falling meters (a flash of green or red around the meter) are all-too brief, and only occasionally accompanied by an arrow. It’s not game-breaking, but it doesn’t seem to know where the line between micromanagement and guesswork is, either. It’s a minor inconvenience. Like most games of this type, Don’t Starve is stupidly addictive—that “just one more” sensation is in full force here, even when that sensation is sometimes tempered by the keyboard-smashing rage of being assaulted once more by a pack of Hounds. And when the sun goes down and the shadows start creeping in, it’s easy to forget some of the frustrating pieces of the game and get lost in this immersive, creepy adventure.